I’m a sucker for movies with romance storylines in Telugu films and as a result I’ve watched, and generally enjoyed, most of Siddharth’s films. He’s always good as a romantic hero although he has a tendency to be rather too chirpy at times, and I would really like to see him in some more serious roles. Although I don’t think that ‘Oy!’ is Siddharth’s best film, it’s one where I think he gives a more restrained performance than usual and as a result his character appears more appealing and likeable. Director Anand Ranga mentions Eric Segals 1970 film Love Story as some of his inspiration during the opening credits, which gives us a clue that the romance is not going to end well. However Oy! is more upbeat than the original, and there is plenty of comedy between the two leads making it less of a tear-jerker. The story starts by introducing the two main characters, showing them as very different people who lead very different lives. 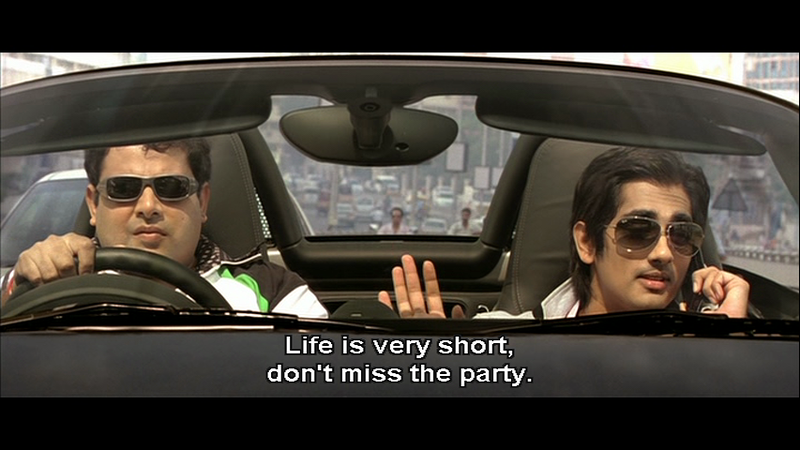 Uday (Siddharth) lives for the moment believing that life is short and must be enjoyed. Sandhya (Shamili) on the other hand thinks in the long-term and likes to plan well ahead. She doesn’t want to rush into anything and takes her time to make well-considered decisions. They also come from very different backgrounds as demonstrated by their modes of transportation. To my delight, Uday’s introduction takes place via a song filmed in Melbourne, and eagle-eyed viewers will be able to spot a few locations which turned up in Orange more recently. I can’t believe I missed them filming this one though. He does have it right about Melbourne! Uday and Sandhya meet by chance in a club where Uday is celebrating his birthday which just happens to fall on New Year’s Day. He’s intrigued that Sandhya is sitting writing in her diary all alone in a bar but she really doesn’t want anything to do with him. To his initial conversation starters Sandhya points out that they don’t match as far as numerology goes, so it’s Happy New Year, Happy Birthday and Good-Bye. Alarm bells should immediately have started ringing at this point, but Uday is made of stronger stuff and immediately sets out to track her down with the aid of his friend Fatso (Krishnudo). Enquires around her neighbourhood also show Sandhya as a rather prickly character with no time for celebrations or religious festivals although she regularly fasts and is addicted to astrology, numerology and the like. So possibly not the best match for a party loving guy like Uday who enjoys the good things in life? Uday’s father is a rich industrialist but as Sandhya hates rich people Uday doesn’t want to tell her about his background. Instead he pretends to need a place to stay just as Sandhya needs money to pay off a loan she has on her house and advertises for a lodger. From here the romance between the two blossoms as Uday sets out to charm Sandhya and convince her that she loves him too. This part of the film works well for me and I like the way the developing relationship between the two is portrayed. However I do have a problem with the story from this point. Despite Uday proclaiming his love for Sandhya and asking her to accept him as her lifelong birthday gift, he still doesn’t come clean and tell her who he really is. This lack of honesty at a crucial point is a jarring note in the whole romance plot and isn’t helped as Uday continues to keep his real life secret. To add to this deception, Uday finds out that Sandhya has a life threatening illness and decides to keep it from her. Not just Uday, but also Sandhya’s doctors decide that she really doesn’t need to know that she is going to die in a few months. This does follow the plot of Love Story, but it was irritating then and just as nonsensical here. The idea of not telling someone they are going to die because you love them so much that you cannot bear to make their last moments unhappy is ridiculous. It is pure selfishness, a reluctance to deal with the reality of the situation and not love at all. Just as infuriating is that when Sandhya finds out she’s not even annoyed, but actually thanks Uday for making her last few months some of the happiest she has ever known! I wouldn’t have a problem at all with him taking her to places she wants to go, and making sure she gets to fulfil her wish-list if he’d only told her why he was doing it. 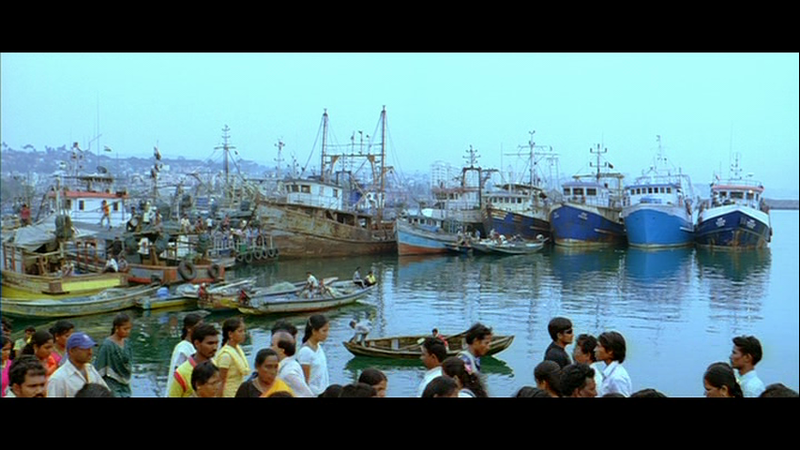 This makes the whole second half of the film less enjoyable, although the trip to Kasi to immerse Sandhya’s parents and grandparents ashes in the Ganges could otherwise have been an interesting journey. There are still some excellent scenes in the second half though, and I love the crowd reaction when they go to see a Pawan Kalyan film on the first day, first show. As you can see it’s almost as good as the audience in Melbourne! There is a separate comedy subplot which involves Sunil as an insurance salesman which ultimately forms the basis for why Uday and Sandhya discover she is ill. I usually like Sunil but apart from his initial scenes his comedy is rather laboured here. There is more unnecessary comedy on the boat involving Ali and Master Bharath which is best avoided. Really, the best comedy is in the romance between the two leads as Uday tries to conform to Sandhya’s list of the qualities she is looking for in a husband. Sandhya is a big fan of lists and seems to have one for every occasion. What makes this film worth a watch for me are the performances from Siddharth and Shamili. The love story between the two is sweet and I like Uday’s happy approach to life in general. Siddharth manages to be cheerful without being manic and this more muted version of his typical happy-go-lucky persona is more realistic and easier to like. Shamili is good in her ‘girl next door’ role and the lack of glamour in her outfits is refreshing. Although she doesn’t have a lot of scope within her role, her change in personality isn’t too laboured and does seem fairly natural. Neither Siddharth or Shamili are brilliant dancers, but they are both fun to watch and the upbeat soundtrack by Yuvan Shankar Raja is excellent. Despite the issues I have with the story there is still a lot I do like about Oy! The film is well shot by cinematographer Vijay K Chakravathy, flows well and looks good with some beautiful locations including Sandhya’s fantastic house by the sea. It’s also lovely to see a different location especially when it ends up looking as well as Vizag does here. I really enjoy the first half of Oy and just wish the story could have taken a different direction in the second half. As a result it ends up being a 3 ½ star movie when it could have been much more. Despite finding Anand Ranga to be pleasant, thoughtful and interesting in his interactions with folks on Twitter and in interviews, I find much of this film unpleasant and shallow. It is technically very well made and looks great but I have too many issues with the story. I have to disagree with Heather on some counts. There is nothing likeable or appealing about the character of Uday, and Siddharth seemed to be playing another variation on his ‘rich kid in love’ roles. He sees Sandhya and decides he has to have her. After all, she is the ultimate novelty – a woman who isn’t interested in him. The rot sets in with his decision to move into her house under false pretences. Compared to other stalker love stories like Anand where Anand knows he will one day have to face the consequences of his dishonesty, or even Arya 2 where Arya is a total nutter and his stalking is shown as part of the madness, Uday has no qualms. He does it because he wants to and we are supposed to find that romantic. My biggest issue is with the treatment of Sandhya’s terminal illness. I’ve had the sad experience of watching loved ones die after battling an illness for some time, so this pushed my buttons. While everyone has a bucket list of things they would like to do one day, that list is often very different when a person is told they don’t have so many days ahead of them. Having Uday and the ‘medical’ personnel decide that Sandhya would be happier not knowing was just disgusting. It is selfish and shows a lack of empathy and respect. Sandhya is a woman who planned for everything, thought through all her options – and they denied her that. Shamili gives a good performance in a role that starts off reasonably well but quickly devolves into a device for making the hero look more desirable. It’s a shame as I liked the way her back story was gradually revealed and Sandhya became more likeable and sympathetic. There were some really nice scenes that showed their developing friendship and the growing relationship. But as this romance was built on lies and manipulation I couldn’t find it charming. I agree with Heather that the songs and the locations are really lovely. But that isn’t enough. I give this 1 ½ stars, just for the songs (especially ‘Seheri’ which was filmed near my old office) and the technical and visual aspects of the film. This entry was posted in Tollywood and tagged Ali, Anand Ranga, Krishnudu, Master Bharath, Oy!, Oye!, Shamili, Siddharth, Sunil, Vijay K. Chakravathy, Yuvan Shankar Raja. Bookmark the permalink. This is one of two Siddharth movies I haven’t seen (180 is the other one.) 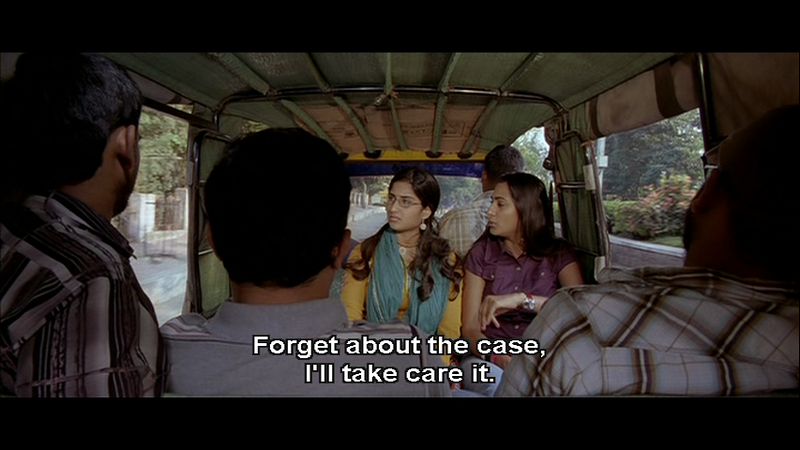 I’ve heard good things about Shamili, but the whole “keep someone’s medical condition from them” plot drives me crazy. Patient privacy and access to emergency care without a police report are two the things that always get my blood pressure up when I’m watching Indian movies. So, if I can get past the fact that I’ll probably spend 10 minutes yelling at the screen, I’ll definitely check this out. It’s a real issue with the story – and just so ridiculous! In real life you couldn’t possibly not tell someone – not if you wanted to keep your medical insurance at any rate! Just imagine the law suits! The first time I watched it I really wasn’t too impressed with Shamili but on subsequent viewings she’s improved – maybe because she gets more likeable while Siddharth gets less so as my irritation with his lack of honesty increases. For all the problems I have with the story it is a well made film and looks good – it’s made me want to visit Vizag and drive along beside the sea – looks awesome! Hi Liz. I really don’t know if 10 minutes yelling will be enough. I struggled to watch Oy! the first time, and had to grit my teeth to get through a recap before writing this. The problem is that the emotional core of this shows manipulative lying scumbags who only care about themselves get rewarded by being treated as tragic noble heroes. Forget the legal and medical issues – how about being a decent human being? Heather is very good at not noticing anything she doesn’t want to (ask her about the gorilla!) and that gift may be the prerequisite for watching this. Cheers. Temple. I haven’t seen this movie. But, it’s standard medical policy in India not to tell the patient about his/her medical condition, but only to the person who accompanies the patient, who is usually a family member. The U.S. concept of the patient being the only one to sign the authorizations for medical procedures is not practiced. Again, it is the accompanying person who signs. As to not getting emergency medical care without a police report (or sometimes being denied precisely because there *is* a police report), you may find it infuriating, but unfortunately I understand that is the law. Again I don’t know what onscreen depction Liz is referring to, but I have read in Indian papers and magazines that, for instance, accident victims may not always get care because the doctor doesn’t want to get involved in a police case. And it’s not an unfounded fear. If the patient dies, the doctor could very well find him/herself pinned with a manslaughter charge at best. So it’s the law and the legal system which is messed up, not the movies which are just depicting the reality around them. Not informing the patient is not something I’ve found to be the case while working with Indian doctors in Tamil Nadu – although I have to admit that cataracts aren’t life-threatening so the situation is somewhat different. It’s always the patient that they deal with directly. However it’s also standard policy to involve family members so that the level of care a patient will be able to receive post surgery can be assessed. I am always shocked at the cases against doctors I’ve seen in the news when I’ve been in India, who have only been trying to help, and we can only hope that this will change as the situations within hospitals improves and people gain a better understanding – although I have witnessed some of the problems within a few of the public hospitals first hand and realise there is a long way to go! The amount of bribery I have witnessed for a start is truly shocking! Not telling the patient is such an alien way of thinking to us though. We always have to fully inform the patient and obtain their consent before telling anyone else (including their immediate family) unless they are not able to understand. To our way of thinking this is the only right way to proceed to try and give some control back to the patient. Plus it’s their life so really they should have the right to decide how to deal with any medical issues. In this film though it’s not just the with-holding of the medical information. Siddharth’s character also doesn’t come clean about his family circumstances so it’s more of a general problem with lack of honesty. I enjoyed reading your review, thank you! I shall give this a skip – like Temple, this ‘don’t tell the patient’ bit would make me fume so much that I wouldn’t enjoy the film at all. There is this attitude of benevolent (and sometimes not so benevolent) dictatorship that men in India have towards women which is so disempowering. It ranges from small things – like ordering at restaurants (this is the BEST, you MUST try this) – to much more serious things. So much as I understand how it could happen that people decide not to tell someone that they are dying, I cannot understand how they can still show this on screen as ideal or even good behaviour..
Again emphasizing that I’ve not seen this film — the “not telling the patient” is standard procedure for both men and women. It is a “realistic” depiction — for all those who demand realism from Indian films. There are some good moments, some fun songs and I like the way they’ve pictured Vizag, but probably one more for Siddharth fans.